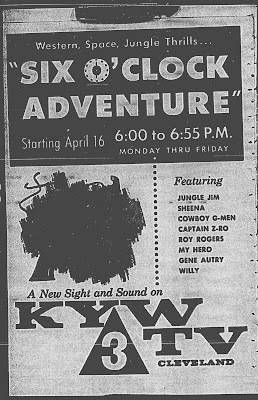 This indicates that Wilson may have only recently arrived at KYW, where he would stay till 1961. 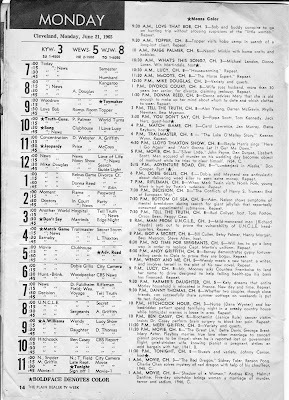 TV Guide ad for varied Thursday evening shows on Cleveland stations. 9AM WEWS-5 Fun Farm with hostess Mary Ellen..Captain Penny (Ron Penfound) would take over Fun Farm by Spring 1957. 7:30 KYW-3 WFMJ 21 Salute to Baseball..90 minute spectacular on the opening of the 1956 Baseball season..
6PM KYW-3 Six o' Clock Adventure-DEBUT-Captain Z-RO and an episode of "My Hero" With Bob Cummings-Big Wilson hosts. 10PM WEWS-5 Boxing from St. Nicholas Arena, NY-The last DuMont series. 10PM WJW-8 20th Century Fox Hour Reginald Gardiner and Eddie Bracken in "Mr. Belvedere"
It is with sadness that I have to report another loss in the Cleveland Classic Television community. 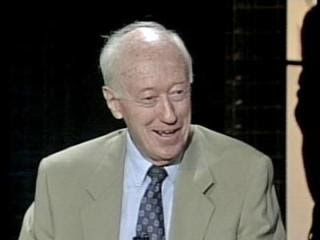 Tom Haley, 88, veteran announcer, newsman and program host for WKYC-TV and it's predecessors for nearly 50 years, passed away suddenly Tuesday morning at Lakewood Hospital after about a bout with pneumonia....Haley began his broadcast career as an NBC Page in New York, then in radio at Allentown, Pa in 1943. 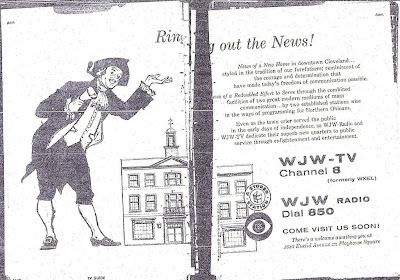 After a stint at WRC Radio in Washington, DC, The Brooklyn, NY Native landed at Cleveland's WJW Radio, before moving to WTAM Radio about the time WNBK-TV began in Cleveland in 1948. Like most early TV performers, Haley did every kind of program imaginable at WNBK/KYW/WKYC. Booth announcing, Program Host, News reader, game show and Movie Host..His earliest program on WNBK was "Haley's Daily"..An hour show which he says he hosted and prepared the entire show himself..He also hosted Cash on the Line..A game show wrapped around a morning movie on KYW-TV..Another Game Show he hosted in the early 60's was Give N Take..As the years went on, he did more of booth announcing and 5-minute news updates then anything else..By the 1970's he began hosting the Sunday Morning Dialogue program..and, around 1980 or so, began to team with Del Donahoo on "Today in Cleveland"..Most younger viewers today remember Haley from Today In Cleveland..The show was a off the cuff, homespun half hour of news, jokes and just plain having fun..Haley retired in 1997..after a 49 year career at WNBK/KYW/WKTC...An amazing feat, considering how volatile broadcasting can be..
Haley's family included 7 daughters, 9 grandchildren and 4 great-grandchildren..From all the tributes I am reading and seeing today, he was the consummate gentleman off the set as all as on..and will be missed..Prayers go out to his family at this time..
Frank Macek's Director's Cut Tribute..
From TV 3's 50th anniversary..Tom Haley Remembers the early days..
WKYC-TV Report with Romona Robinson and Eric Mansfield..from Frank Macek..
A Final Thought..Tom Haley is more than likely the last WKYC link to the WNBK days..Also one of the last links to truly local television in Cleveland. I'd like to publicly thank Ms. Vivian Goodman of WKSU-FM and Jim Davison for the kind comments on the "Cleveland Broadcast Museum" post a few days ago, as well as the other comments on that subject, and also the comments on the WKBF audio post..
Rich Emery of Hamilton, Ohio who writes to me regularly about posting ideas, and shares his thoughts about classic TV/Radio..has found a Olympia, Washington Newspaper obituary about Thomas T. Goldsmith, founder/operator of WTTG-TV 5 Washington, DC with Allen B. DuMont. WTTG was one of the DuMont Network owned and operated stations and is now Fox 5..Goldsmith was one of the pioneers of early TV. He passed away March 5..
Also:I've gotten in touch with retired TV personality Gordon Ward through Facebook recently. Ward was an announcer/Newsman at WNBK/KYW-TV for much of the 1950's before spending many years as an anchorman at WTOL-11 "Toledo Eleven"..He is living in retirement at age 83 in the Toledo area..Always good to know some of the pioneers are still around..
Update:Here is Mr. Ward with a 1956 KYW-TV sign-off..
Cincinnati Kids TV Institution "Uncle Al" Lewis passed away Saturday Morning at the age of 84. He hosted the Uncle Al Show aat Scripps-Howard's WCPO Channel 9 in Cincinnati from 1950-1985,,Most of the time with his wife, Wanda. Both Al and Wanda were/are Cleveland natives. 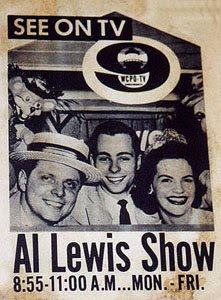 Mr. Lewis began his career at WEWS-5 Cleveland as an announcer and artist before he and Wanda moved to Cincinnati to help start up WCPO-TV in 1950..ABC-TV carried Uncle Al nationally at 11AM Saturday Mornings in 1959-60. For a time in the early 1970's, Uncle Al was carried on WEWS-TV 5. 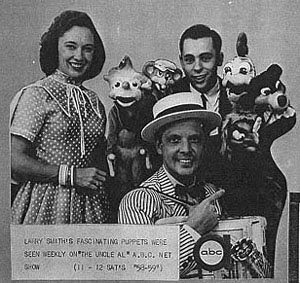 The Uncle Al Show was the longest running Local Kids TV Show in History..
Includes links to WLWT-5 and WKRC-12 Reports.. While this is'nt directly Cleveland Related, I felt we should mention it because of his Cleveland Connections and the fact that he is an Icon in Southwestern Ohio..Best Wishes and prayers go out to his family..
As you may notice, included on the right side of the page is now a reference to "Twitter"..Following the lead of Fox 8 and Ohio Media Watch, we decided to sign up. There will be updates of Cleveland Classic Media as well as times I will be away. etc.. and other personal notes as warranted..I've already had 3 followers and I appreciate it. I havent mentioned this, but I also have the Blogger "Followers" application and there are 17 blog "Followers"..Very humbled and thankful for that..Have a good week all..
From our friends at Ohio Media Watch:Paul Harvey, iconic Newsman and commentator for ABC News well over 60 years, has passed..
WHBC -AM in Canton had carried his programs continually since 1951. Other stations had just recently stopped carrying Paul Harvey News..Prayers to his family and friends at this time.. 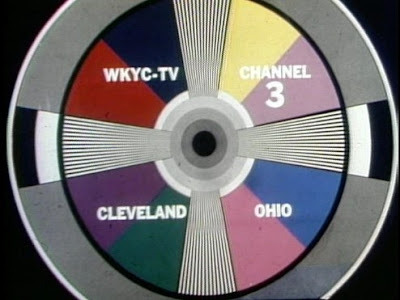 Since I've had access to the Internet on a regular basis..Over 10 years or so, Ive learned a great deal about the fine Museums in New York, Los Angeles and Chicago that celebrate Television and Radio Heritage..I always thought, with Cleveland's radio history, there should be something similar, albeit on a smaller scale, for Cleveland and Northeast Ohio.. In the last several months, Jim Davison has opened such a museum at the Colonial Arcade, 530 Euclid Avenue in Downtown Cleveland, filled with memorabilia of Radio in Cleveland, mostly from the top 40 era, but also dating as far back as the 1930's. The Museum is located in the basement of the Colonial Arcade, sharing space with the Baseball Heritage Museum. Early Poster of Alan Freed's "Moondog" Show on WJW Radio..sponsored by "Record Rendezvous"
KYW-1100 Poster with pictures of the airstaff..This would be around 1963-65..
WJW-85 Welcome sign, with a WDOK 102.1 T-shirt, among other items..
Full Page Ad of Bill Randle of WERE-1300 from a Trade Magazine in the 1950's..
From 2 different eras..a 1944 Presidential Election Poster from WTAM and What I believe are some 1970's pictures of the WGAR Air Staff..
WTAM program schedule from the early 1950's. Johnny Andrews is featured here on the "Morning Bandwagon" Jay Miltner was a featured singer in the WTAM Orchestra before becoming an icon as WNBK/KYW/WKYC announcer for over 30 years..
Uncle Jake Record from Gene Carroll's early days at WEWS. While he had been known as half of comedy duo Gene and Glenn on NBC Radio in the 1930's..Few realize Carroll played Lena the Maid on NBC Radio's Fibber McGee and Molly in part of the 1946-47 season.. These are just a few of the exhibits. The Museum is generally open 11AM-1:30PM Monday-Friday and Admission is free..